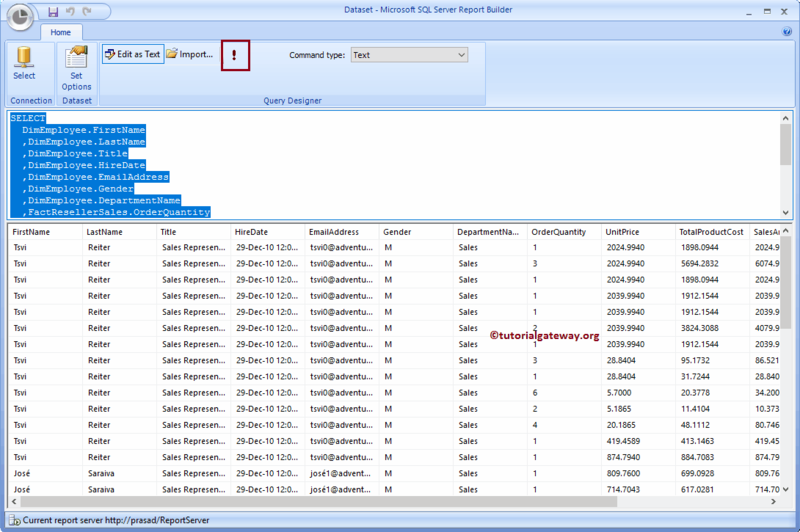 In this article, we will show you, How to create a New Dataset using SSRS Report Builder Wizard. 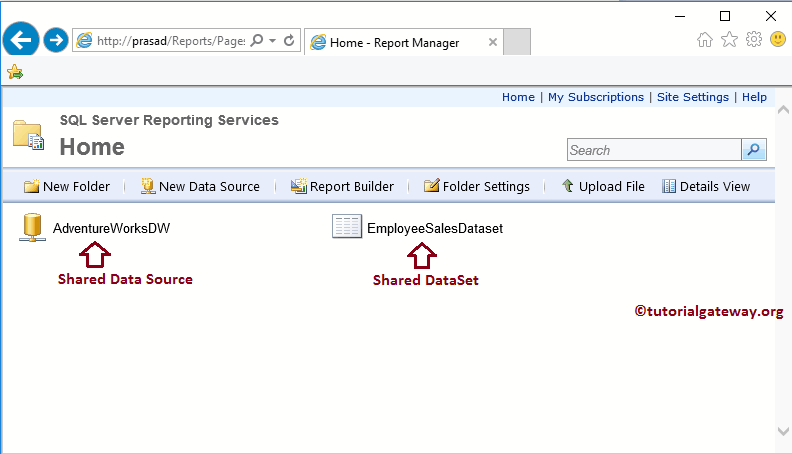 Or we can say, steps involved in creating a Shared dataset in SSRS Report Builder. For this, we are going to use the Shared Data Source that we created in our earlier posts. 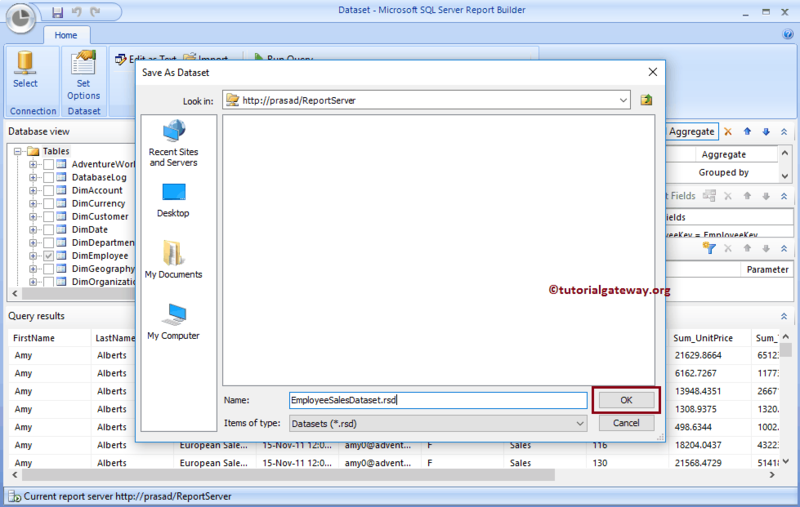 Once you click on the Report Builder button, Microsoft SQL Server Report Builder will be opened with a starting page as shown in below screenshot. If you observe the below screenshot, the Create button at the bottom is Grey out. 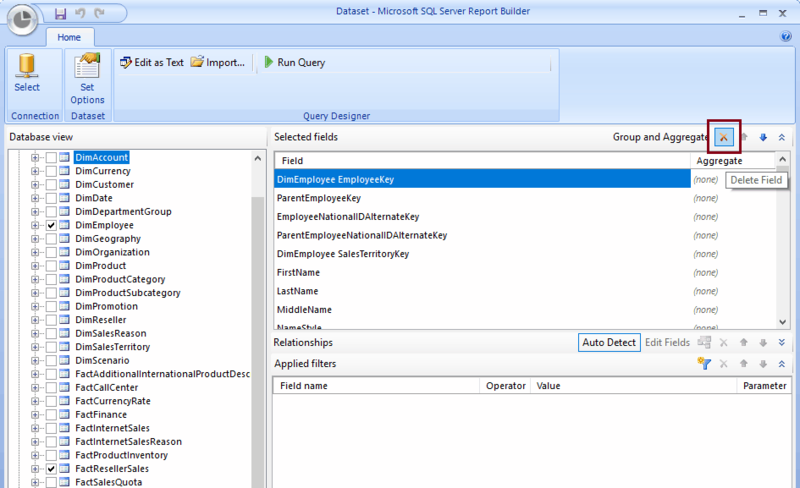 This is because report Builder needs a data Source before it starts creating the dataset. So, let me Browse the existing Data Source by clicking the Browse other data Sources.. hyperlink. Remember, you can’t create a Data source at this point so always create a data source before you create the dataset. 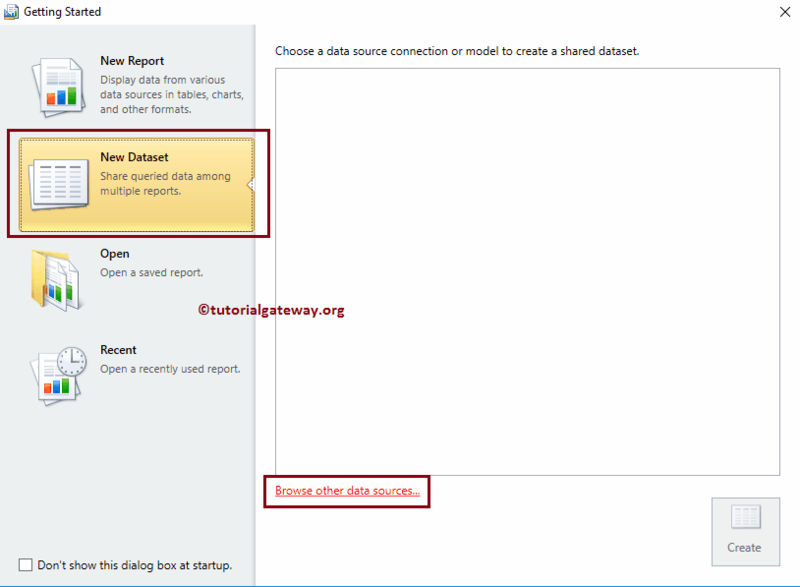 Once you click on the Browse other data Sources.. hyperlink, a new window will be opened to select the shared data Source from the Report Server. 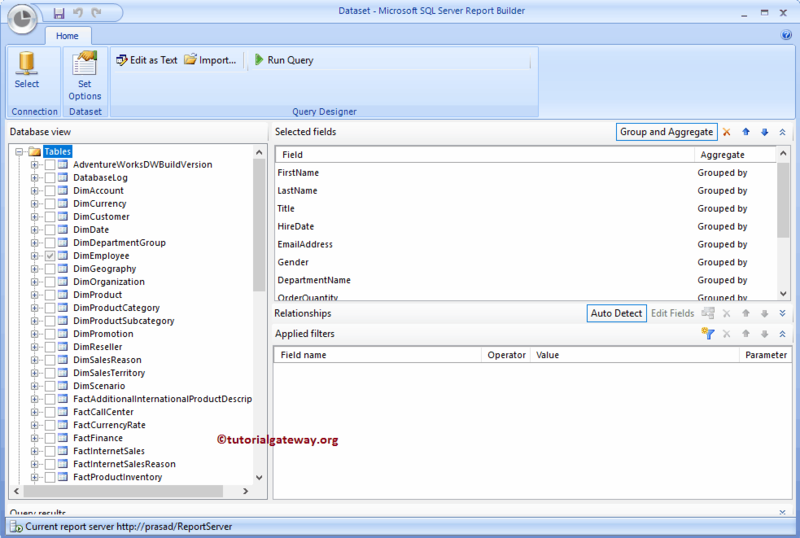 Once you click on the Create button, report builder will be opened with the following Window. 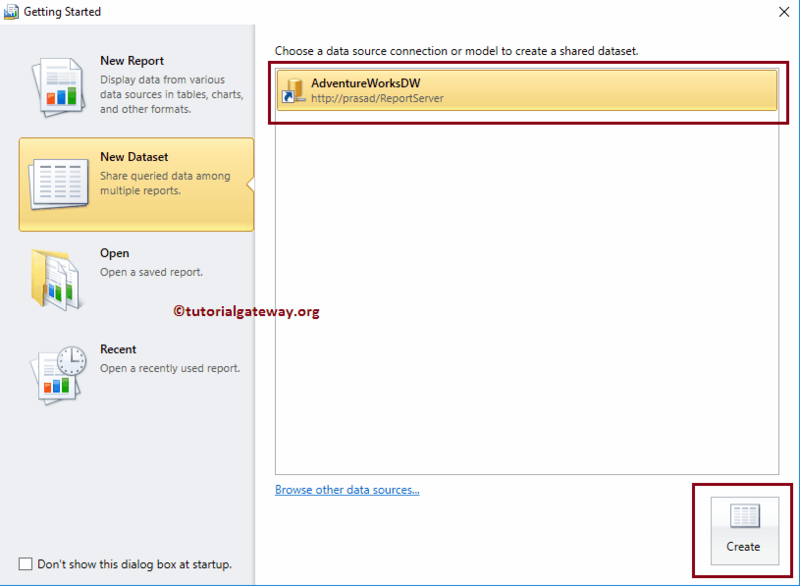 Under the Database View section, you have an option to select the existing Tables, Views and Store procedures present in the Adventure Works DW 2014. In this example, we will select two tables from the Adventure Works. 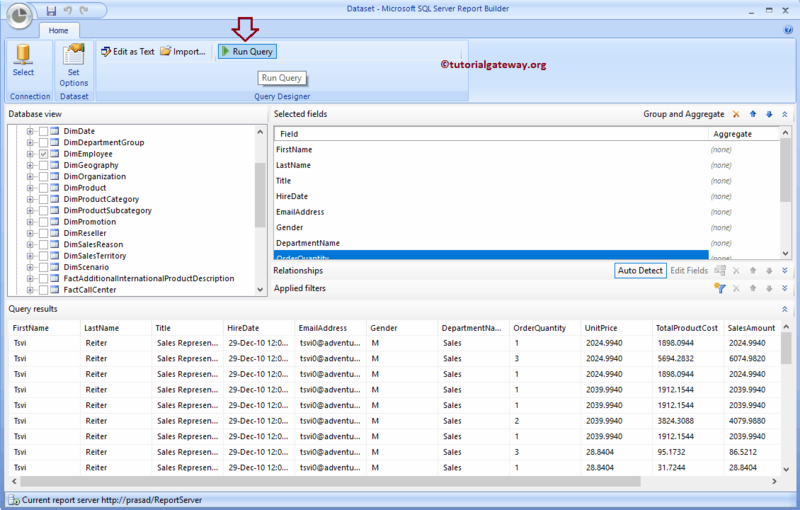 To do so, go to Database View pane and expand the tables folder. From the below screenshot you can see that we are selecting the [Dim Employee] table and the [Fact Reseller Sales] table. Once you check mark those tables, all the fields (or Columns Names) present in both the tables will be added to the Selected Fields pane. As you can see from the below screenshot, under this section we had the Delete field button to delete the unwanted columns from the dataset. In order to delete a field, Please select the filed and then click the Delete Field button. 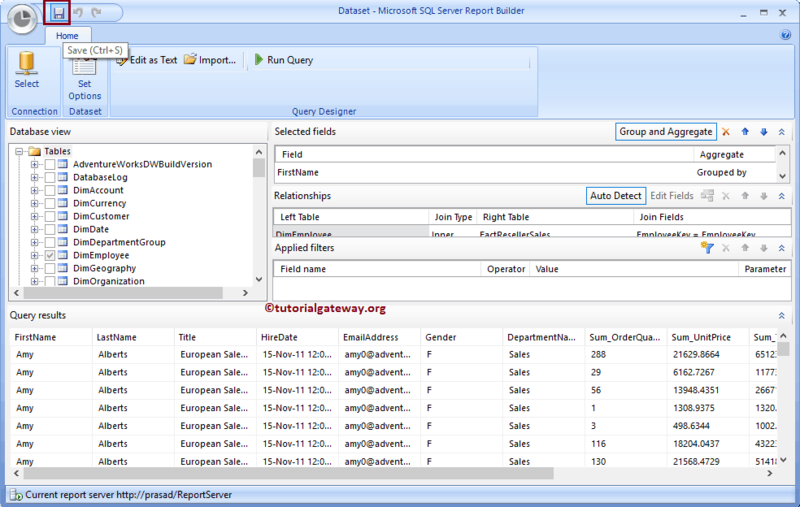 Once you finish selecting the required Tables, Fields please click the Run Query button to check the data that the generated query is returning. 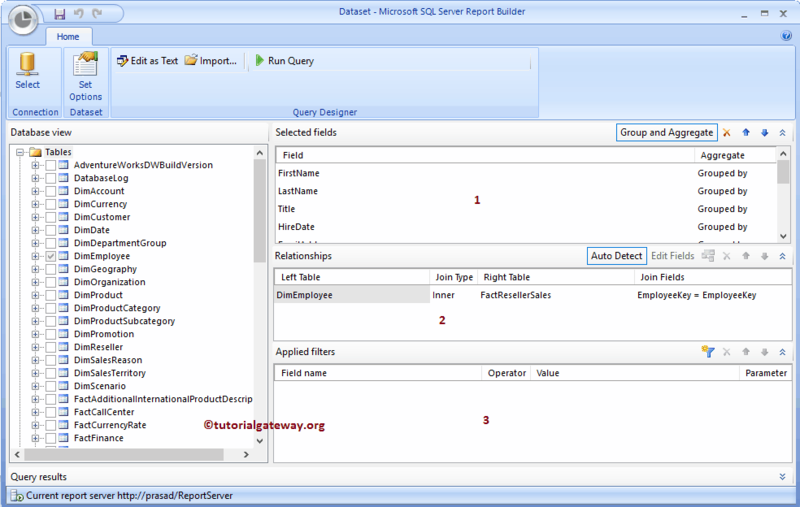 Once you click on Edit as Text button, following window will be displayed to write your custom SQL query. 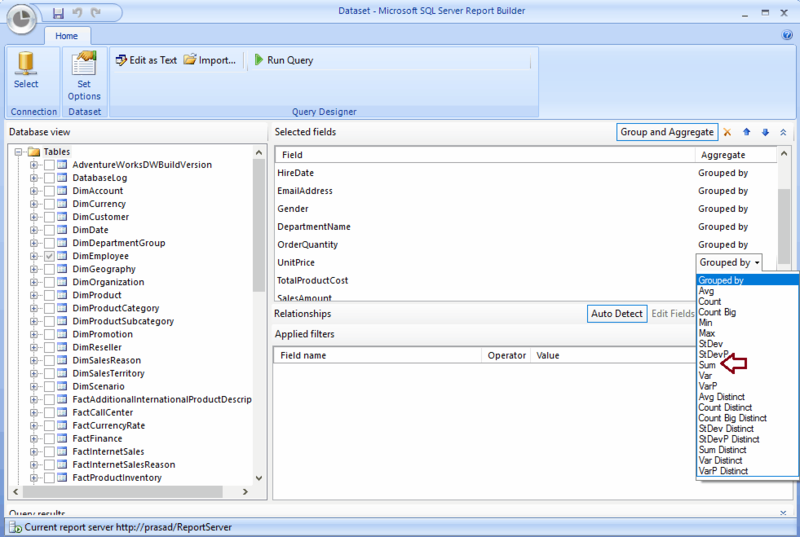 Once you finish writing the query you can use the Execute button for the result. For now, we will stick with the query that we created in our previous step. Under the Selected Fields section, we had the Group and Aggregation button. by clicking this button will add Group By condition to all the fields present in the Selected Fields section. You can see the same from the below screenshot. let me add the Aggregate Functions to the Numeric columns. 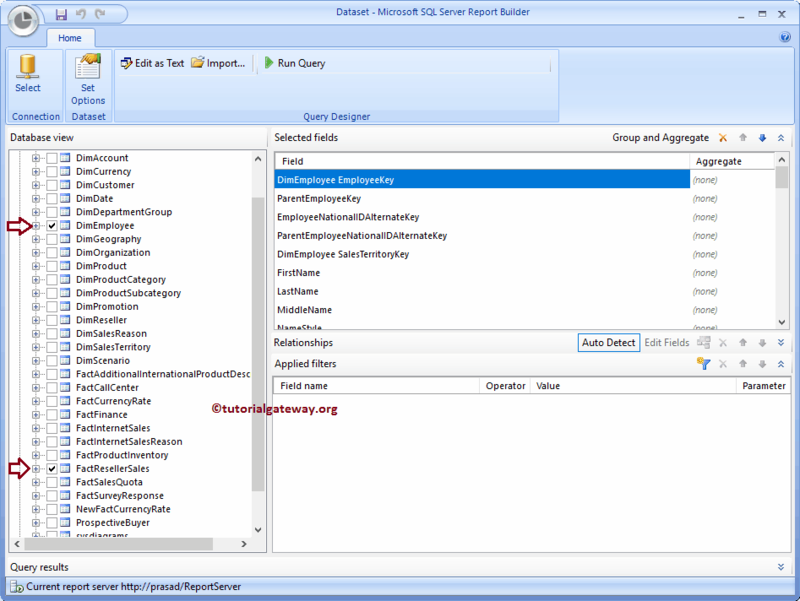 To do so, Please select the column with numeric data and change the Aggregate from Group By to Sum. I think I forgot to explain the Panes under the Query Designer. 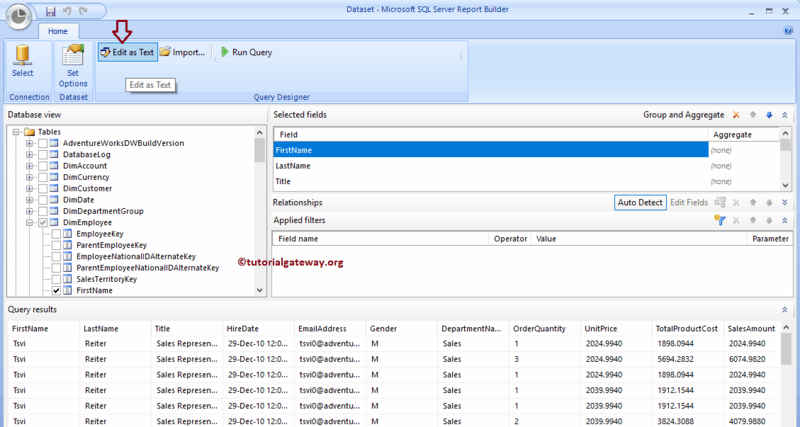 Database Views: This pane will list out the existing Tables, Views and Store procedures present in the Data Source that you selected. 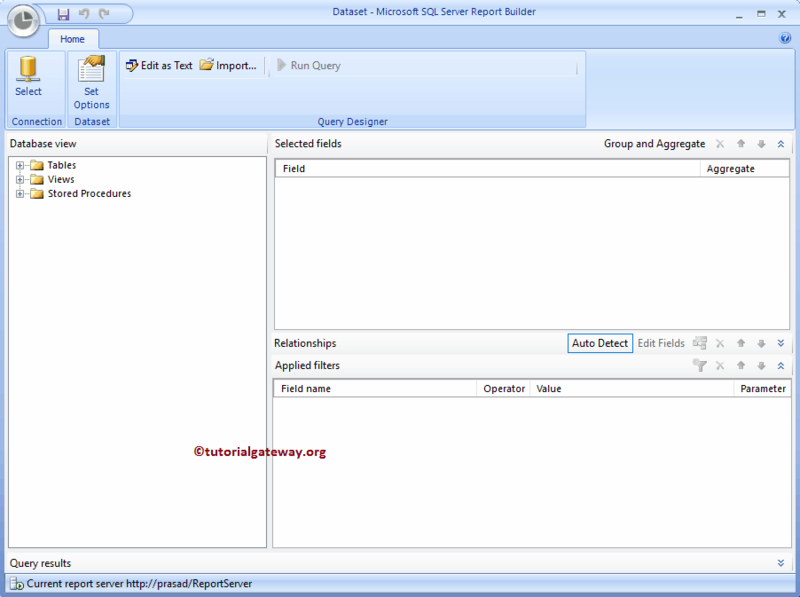 Selected Fields: List of fields that are available in the selected Tables, or Views, or Stored procedure. 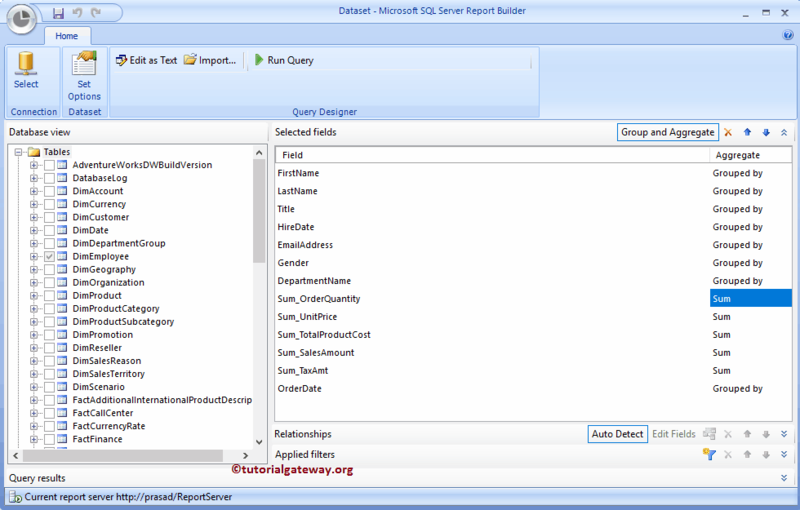 Relationships: Report builder is intelligent enough to find the relationship between the selected times. 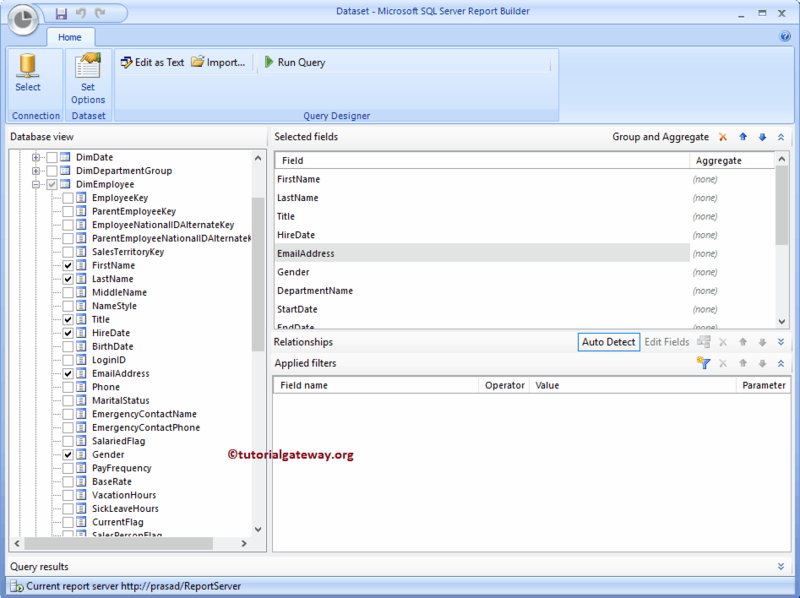 But if you want to exclusively provide the relationship then use this pane. To do so, Please select the Edit Fields and select the common filed from both the tables. Applied Filters: Use this pane to apply filters at dataset level. To do so, click on the filter button and add the filter. 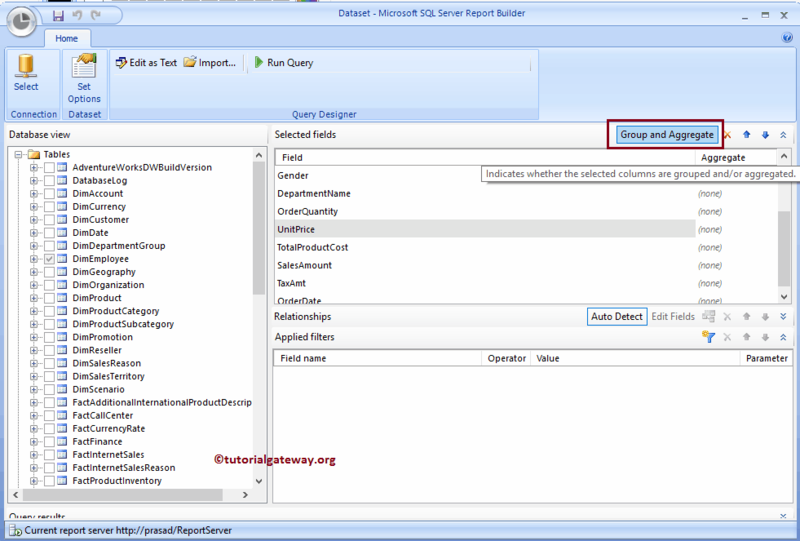 We already explained the Filters concept in our previous article so please refer Filters in SSRS article. 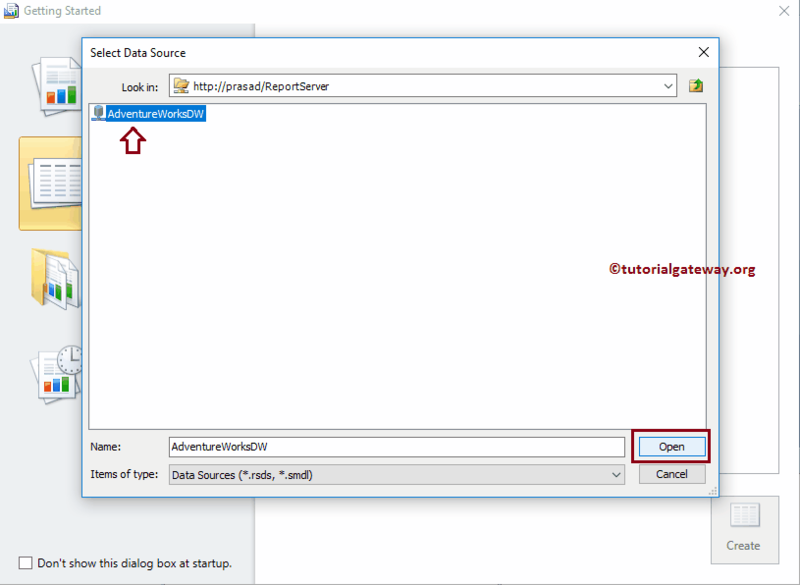 Once you finish designing your query (Dataset), click the Save button as shown below.